This extremely readable story is in a new series from the author of the "Richard Nottingham" series of historical mysteries. 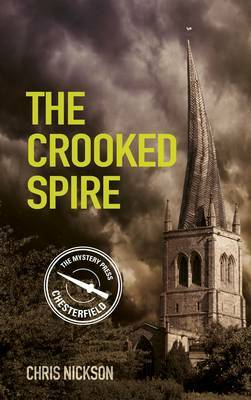 THE CROOKED SPIRE is set in the year 1360 and introduces John Carpenter. He is known as "carpenter" because that is his trade and he walks from town to town carrying the tools that he inherited from his father - also a carpenter - who died in the Black Death. He had worked in York on the Minster there but then left for Chesterfield and here he finds work erecting a new spire on a church. No sooner than he starts working for the master carpenter than the next day, John finds him murdered when he comes into work the following morning bright and early. As he is only one of the first people to appear on the work site he finds that he is considered a suspect and he discovers that he must prove to the coroner that he is innocent in order to receive back a fine that is made against him as 'finder' of the dead body. John has great difficulty, as a stranger in town, to prove his innocence and soon more deaths follow quite quickly as it appears there are some powerful enemies who do not want John to be successful in his quest. John has very few friends to help him but a young man called Walter is a great help and the boy has a sister, Katherine, who is a source of companionship and aid in other ways. The author powerfully evokes a sense of time and place with all the detailed and meticulous research he has carried out for this very suspenseful and well plotted story of corruption and murder. I started this story one evening expecting to read just a few pages to set the scene, but he writes so powerfully that I could not put the book down and go to bed until at least 80 pages had passed! Once you start this very atmospheric book it is difficult to put down as the characters and situations are so vividly described and I had so much sympathy for the protagonist. This is a one of the fastest moving but historically evocative stories that I've read in years and I hope that I have the opportunity to read more adventures from this very gifted author in the future.